Amish women have their babies in one of three places–at home, in the hospital, or at birthing centers. Some Amish prefer the at-home or birthing center options for reasons of cost and comfort. Midwives working in the community are both Amish and non-Amish, and may be licensed or unlicensed. Midwife-assisted birth is another in the list of issues involving Amish which have garnered controversy. Like the raw milk or child labor questions, this one involves government regulations concerning health and well-being. And it’s one of the relatively few which have compelled Amish to take the form of organized public action. For example, hundreds of Amish and Mennonites gathered at the PA State Capitol in 1990 in support of a midwife bill. They showed similar support for an uncertified PA midwife in 2007. 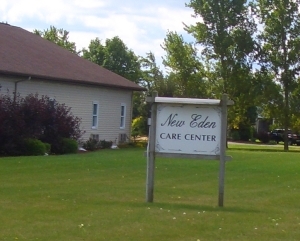 A recent article in the Coshocton Tribune looked at the New Beford Care Center, one of a handful of birthing facilities in the state of Ohio. The Center was built by the community “to fulfill the dream of Amish midwife Laura Gingrich, who provided midwifery services in the community out of her basement.” The facility is fitted out with Amish-friendly amenities, including a double bed for fathers to stay over. Medical intervention is low at the center. In 2011, four of the center’s 100 patients were transported for medical treatment, two of those being C-sections. The reason medical assistance is so low is because to be religiously exempt from licensure, the staff can only provide care to low-risk clients. For those emergency cases, Dr. Gabriel Yandam, of La Femme Obstetrics & Gynecology is the center’s back-up obstetrician. “Anytime a medical issue arises, we transfer to him and he takes care of them at Coshocton Hospital,” Boyd said. A heliport outside the entrance to the building allows for a quick transport. Boyd said the patch of grass marked off by specialty lights mainly has been used for other emergencies within the community. Though the centers have been popular, certainly not all Amish have their children outside the hospital. For those that do prefer alternative settings, birthing centers are helping to fulfill that role. Read more on where Amish babies are born. A friend sent me a book ‘The Gentle Art’ which tells about a midwife who trained in Scotland and then went to work in Lancaster County among the Amish women there in the eighties. It’s by Penny Armstrong and Sheryl Feldman. Penny is the midwife. I think it may now have another title but second-hand copies may still be available. Considering how many babies are delivered by NYS Troopers in cars because so many rural areas are so far from a hospital, a birthing center in the community is probably a better idea than some people think. I am always in favour of midwifery. I truly believe that both my deliveries would have been better and less traumatic with a midwife. The name of the book Fran was referring to is “The Midwife’s Story” and it’s great. Midwifery, especially in the Amish communities is such a better alternative to hospital births. My c-section would not have been necessary if I had been attended by a midwife. It is a gentle art and mothers and fathers are instructed in the natural birth process and the atmosphere is more condusive to a calmer, more personal labor and delivery. I firmly believe there would be easier, less invasive births in this country if there were more midwives. Our little ones were both born at home with midwives in attendance. They were both big babies, born near 43 weeks, and had we been under the care of a mainstream obstetrician, we would have been under so much pressure to have labor induced, with all the subsequent risks of intervention rather than natural birth. It was such a blessing to rest and recover at home, and have the babies in my arms at all times. Our midwives were so sweet and gentle and helpful. They become like members of the family. Both of our babies slipped into a routine of sleeping all night from day one, I think because there was no out-of-home stay to disrupt their first days. One of my good friends has eleven healthy children, all born at home except for the eighth, for whom she “heavy labored” for 20 hours before going to the hospital. The Amish view every childbirth as a natural event; modern medicine views every childbirth as an emergent illness, requiring immobility, monitors, and medications (all of which are not completely effective in preventing unfavorable events). I read a great book by Dr. Elton Lehman called “House Calls and Hitching Posts”. He eventually started a birthing center in Ohio. I believe his son practices there as well. Also another, titled “Dr. Frau” by Dr. Grace Kaiser. Have you heard any reports as to whether any Amish settlements received a lot of damage [or worse] in the heavy storms over the weekend? Thanks. Char I was wondering the same as I noticed a lot of the states hit had significant Amish populations. I have not heard. Looks like a lot of people were killed. I would love to give birth at home (I think, it is my first child) but here in Sweden it can be hard to find midwives who want to attend homebirths and you often need to pay for it yourself while hospital births are always free. Our hospital births are however normally managed by midwives and not doctors but I feel a strong dislike for hospitals and because of a previous bad experience I find it hard to trust hospital staff at all times. I grew up in Sweden and two of our six children (our second and our third) were born there in hospitals. I had good experiences both times and I think that the midwifes have a different outlook than some in the medical field.They really care and love their job which shows in the care they give. With his being your first child I think you should take advantage of the hospital birth. Having a baby is a natural thing of course but it is a comfort to have medical aid available especially until you know how you and your body handle a birth. I had our fifth and sixth child with a wonderful Mennonite midwife in her home based clinic and it was wonderful experience both times. (Our first and fourth child were born in Us hospitals). If you go on to have more children and everything went well the first time I think it would be well worth considering the homebirth option in the future. Good Luck and Best Wishes! I am in full support of Amish Birthing Centers, and other Birthing Centers, as well. It should be the parent’s CHOICE of where they would like their babies born, whichever is the best for them and the mother. Nothing wrong with the natural way, plus having a medical doctor or hospital nearby, if the situation warrants. Birthing Center — sounds like a wonderful way to be born, for everyone, Amish or not. Childbirth at its heart is a natural process, not an illness or disease that requires medical intervention. Having a nice birthing center, with trained midwives. In the rare event of complications, ambulances can be summoned. This is one Amish idea that is clearly making in roads into the wider community, and for good. My father was born at home, and family lore (so he says anyway) has it he was kept warm near or inside a wood burning stove. I don’t know about midwives, older sisters I guess, aunts and neighbors where around for my grandmother, perhaps. January babies had it rough in the 1930s [He was older when I arrived, I was a lazy baby, I joke, I let Mom and Dad enjoy most of the 1970s without having a child]. If you like, pray for him to feel better as he’s currently hospitalized. I’d appreciate it at any rate. I wonder how one *becomes* a midwife, either licensed or unlicensed, in the state of Ohio. I’d think it’d require a lot of education! I know I posted earlier and recently, but afterward I got thinking about it, Ontario allows midwifes in the province. I don’t know the details of licensing and training, but I am aware of at least one office that, apparently, a group of midwives operate from. I’ve stood in front of their office many times, in fact I’ve been inside when a service I utilized was in the same office space. Optometry and birth are two different things. I think it’s a wonderful idea! I would have live this for having my babies. I had thought of a midwife, but there was none to be found. I visited midwives during all 4 of my pregnancies, and I tell any expectant mother (or those who had issues with the drs. during a pregnancy) to go to a midwife. Midwives take time to know you. They treat you more like a long-lost friend than a patient/paycheck. I did have to see drs. during my pregnancies, just in case the midwife was busy when I was in labor, and I HATED it. I spent less time with the drs combined than I did with my midwife during one routine exam. Although I used midwives, I delivered in hospitals. I wish I could have delivered in a birthing center, but extremely fast labors, necessary antibiotics, and living in highly urban areas “required” a hospital birth. Even with hospital delieveries 2 of my children were born naturally…something that isn’t heard of often, especially if a doctor is involved! I know there are classes available to take if one is interested in becoming a midwife. There are even one or two training/birthing centers especially designed for midwifery (one is in Florida). Overall, I think the idea of birthing centers that are sensitive to its clients (double beds for dad to stay over, little or no electric lights, etc) is a great service! What better way to bring a blessing into the world than in a peaceful, comfortable surrounding. As always, thanks for the post Erik! I was hoping to locate a midwife who caters to mostly the plain community to whom I can (anonymously) donate some (plain/basic/no design)cloth diapering supplies for her to distribute to clients as she sees the need. I contacted one center in PA just to gauge interest in accepting such a small care package/donation, but have yet to hear back. Any suggestions would be appreciated. I would have a contact in Missouri, if that area interests you. Could Erik put us in touch? Linda- area is of no matter to me…my desire is simply to get some extra cd supplies I have into the hands of decent honest Plain mommas who can use them… U may contact me off this list if u desire-my fb name is Nicole Zielinski Harrison (my pic is a ‘biohazard symbol with a red heart & chaos on it). Peace be with you!